With Singapore Design Week coming up, we’re looking forward to checking out the best designers in the region, fueling our design inspiration boards on Pinterest to duplicate into our own apartments. A well-designed and aesthetically pleasing living environment is important, after all. However, while we deck out our homes in swanky furnishing and the trendiest hues, our office spaces should definitely not be neglected. Besides, we spend just as much time (if not more) in the office – so it does make a huge difference if you love where you work. You know, instead of just waiting to dash off at 6 pm. This goes just beyond aesthetics. It has been proven that a great office environment, with brilliant design, plenty of natural light and the great outdoors that is brought inside, boosts productivity as well. With these cues in mind, we take a look at some of the best well-designed working spaces in the region. 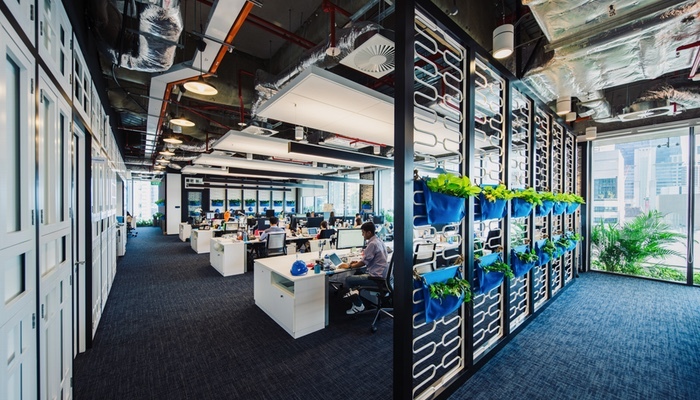 From a space inspired by beautiful apartments around the globe (no points for guessing which company) to one with a large indoor slide (for adults, obviously), here are the coolest office spaces in Asia. Who knows, you might not even mind working overtime. If there’s an office design inspired by destinations around the world, Airbnb’s has to be it. 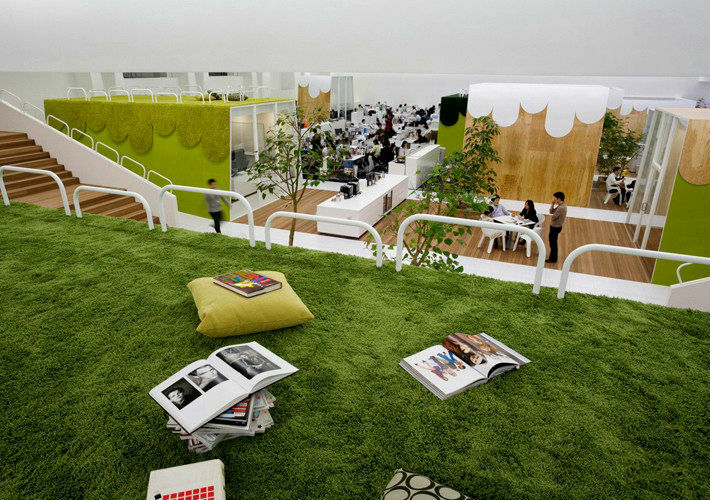 Singapore architecture firm Farm dreamt up the office design – influenced by Singapore’s heritage and famous landmarks. The meeting rooms are also inspired by unique homes from destinations all over the world – which includes an apartment in Batignolles, an Andy Warhol-inspired art loft in Bangkok, and a caravan in Cornwall. Inhabiting two floors as well as a large external terrace, Leo Burnett’s headquarters in Hong Kong is a dynamic space inspired by cultural and historical events – from the local hipster culture of the post industrial Kwun Tong to the vibrant urban life of Williamsburg, Brooklyn. The office spans two floors and features a large external terrace, supporting a highly dynamic working culture of a creative agency through a variety of spaces – such as open plan work clusters, semi-private discussion areas, private meeting rooms and enclosed offices. The design encourages social interactions between staff to increase creative thinking and collaboration. Local artist and LASALLE faculty member Nicholas Ooi designed this bright and airy APAC office with help from his team. Inspired by Singapore’s heritage, the interiors features classic Singapore design like Peranakan-inspired tiles and classic old HDB grilles. As a tribute to its roots, Twitter’s core values are showcased in the design concept – along with their first ever tweets from all around the globe. In a bid to create a calm and stress-free environment, M Moser Associates has dreamt up interiors that feature wooden tones set against white walls and modern fixtures throughout the boardroom, reception and work areas. If that’s not enough stress release, ordinary stairs have also been turned into a work station and a playground slide. You know what they say, there’s a kid in all of us. In a joint venture between TBWA, a global advertising company and Hakuhodo, Japan’s second-largest advertising agency, this office with indoor lawns occupies two floors of an eight-story amusement complex in downtown Tokyo. With double-height ceilings, two-meter tall beams that run the length of the space and trees scattered all around, the designers brought nature indoors – which as we already know, can be a great productivity boost.